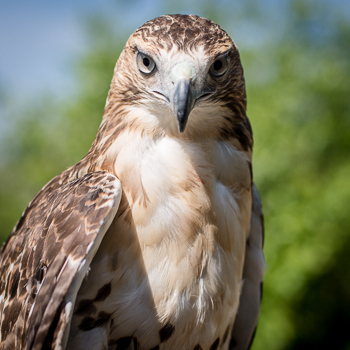 Grace arrived at the Medina Raptor Center in 2014 as a first year bird with a wing injury due to being hit by a car. During the healing process, part of the joint fused so that she could not get full extension on the wing, inhibiting her ability to get significant height or sustained flight. She had a wonderful disposition around people, so she was added to the permit to become an educational ambassador for the Center.